John Childers earns VMware Technical Solutions Professional (VTSP) 5.5 Certification - Ocala, Gainesville, Orlando | Verteks Consulting, Inc. 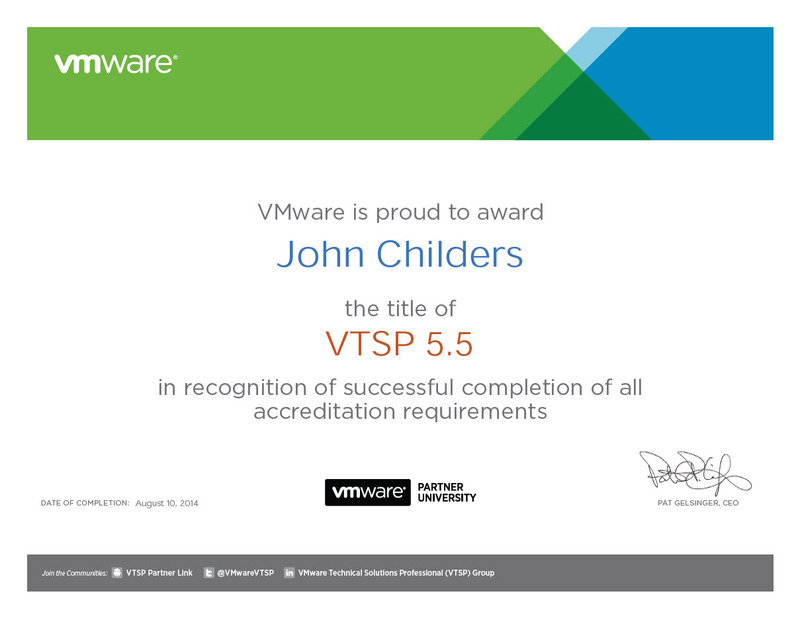 Please join me in congratulating John Childers on earning his VMware Technical Solutions Professional (VTSP) 5.5 Certification. This is John’s third VMware certification. I appreciate John’s commitment to his professional development and I'm proud of his effort to complete this additional coursework and pass the certification test as well. Please join me in congratulating John Childers on his achievement of greater mastery of VMware so we can better serve our customers. Way to go, John!